The stylish Spirit EL-7 elliptical trainer has a very smooth ride, plenty of resistance, and a 15-degree motorized incline. The blue backlit LCD console is easy to use and read. With one-button programming, you can quickly select one of the 20 exercise programs or adjust the 20 levels of magnetic resistance. Trainers and pros find that the Spirit EL7 elliptical trainer offers several commercial quality features: a roomy 20" stride length, a high quality motor for the incline ramp, a heavy 30-lb flywheel, Eddy Current Braking system, four chrome guide rails, and a large commercial size footprint (82"x 27"x 67"). Its self-leveling pedals have a 2-degree inward slant for better ergonomic comfort and less foot numbness. The stationary handlebars include built-in heart rate sensors for monitoring cardio output during the workout. 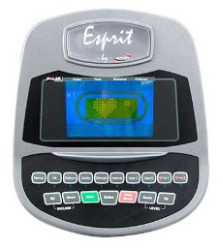 User elliptical reviews on the Spirit EL-7 have been pleasantly positive. Satisfied owners are happy with the solid feel, smooth stride, and fluid ramp adjustments. Unlike some elliptical trainers that come with poor instructions and take up to 3 hours to assemble, this one is straightforward. You will have it out of the box and be pedaling in about 30 minutes to an hour. For best results, plan a maintenance schedule for once a month to add lubricant to the tracks. That will keep it running quiet and smooth. 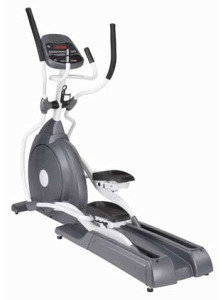 Priced at $1,450 at Amazon.com and up to $1,699 at other online retailers, the Spirit EL-7 is a solid elliptical trainer but not outstanding. It is basically the Spirit XE550 of two years ago with an added incline feature, and it isn’t much different than the EL-5 model. However, it doesn’t keep up with new technology that has come out in 2009-2010. To see what we mean by new and innovative, compare the Spirit EL-7 elliptical trainer to the more advanced Yowza Sanibel Elliptical Machine which sells for $1,499.